You are here: Home » MEDIA » Books » Star Wars: From A Certain Point Of View, by various (book review). Star Wars: From A Certain Point Of View, by various (book review). Alan Dean Foster started it all with ‘Splinter In The Mind’s Eye’. After ghost-writing the original Star Wars novelisation and before the idea of a ‘franchise’ was even born, he crafted a follow-on story for Luke Skywalker and co. that involved Darth Vader, mysterious force amplifying crystals and a rather-unfortunate-in-hindsight kiss between Luke and Leia. The Star Wars Universe was expanded and we were off to the races. Of course, this expanded universe brought with it a tonne of continuity and after Disney snatched away Lucasfilm, this was all rebranded as ‘Legends’. That is, we’re not even thinking that any of this is in anyway related to the continuity we have going on now. But the legacy of ‘Star Wars’ being a universe filled with a myriad of characters, all with a story to tell remains. Chiefly released to celebrate the 40th anniversary of ‘Star Wars’ last year, ‘Star Wars: From A Certain Point Of View’ also seems to be a testament to the sheer amount of different creatures and creeds that inhabit the Star Wars Universe all with their own unique perspective. 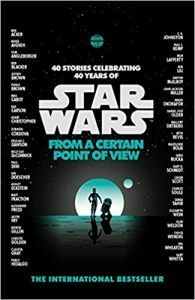 Indeed, ‘From A Certain Point Of View’ sort of does what it says on the tin, telling the story of the ‘Star Wars: A New Hope’ from the perspective of 40 various different ancillary characters. The opening story ‘Raymus’ tells the story of Raymus Antilles, the ill-fated captain of the Tantive IV, the ship boarded by Darth Vader at the start of ‘A New Hope’, while the follow-up story ‘The Bucket’ has a member of Vader’s elite guard tasked with capturing a certain Princess who he finds hunched in front of an R2 unit. Placed in order of the film’s chronology, the very nature of the collection means this is very much a mixed bag. There are stories that are whimsical and fun like ‘The Sith Of Datawork’ by Ken Liu examines how to get by in the Empire when you need to file paperwork. While others that are more serious. The end run of stories focused on the attack on the Death Star such as ‘Grounded’ and ‘Desert Son’ are all pretty heavy affairs as they tend to focus on those who will ultimately not come back from the missions. The same goes for Madeleine Roux’ story ‘Eclipse’, focusing on the final few hours of Alderaan. There are, thankfully, just a few that revel in being a bit silly. The Emperor’s ambitions done as a Shakespearean monologue in ‘Palpatine’ and Jeffrey Brown’s one panel cartoon ‘Far Too Remote’. Perhaps the most successful run of stories comes during the Mos Eisley section of the book, with the ‘wretched hive of scum and villainy’ providing many weird and wonderful characters from which to spin stories off. ‘The Kloo Horn Cantina Caper’ by Kelly Sue DeConnick and Matt Fraction is a brilliant and silly crime caper while legendary Batman writer Paul Dini adds a bit more to the Boba Fett mythos with the fun little ‘You Owe Me A Ride’. Also, the two luckless bar patrons who meet a rather grisly fate when they hassle Luke at the Mos Eisley bar? You’ll find out much more about them across a range of stories. Of course, this is filled with plenty of references and in-jokes and, while it’s not totally alienating for someone who just wants to read a collection of SF stories, a good knowledge of ‘Star Wars’ mythology does help a lot. The spectre of ‘Rogue One’ also looms large throughout the collection with many references made throughout the stories. For ‘Star Wars’ fans, this is an immensely entertaining collection that keeps the stories moving on at a cracking pace and, whilst revelling in riffling of ‘Star Wars’ mythos, manages to keep on the right side of ‘boring fan service’. With a collection of very good writers and a handful of really excellent stories, this is a fine way to celebrate more than 40 years since a very, very, very big universe came onto our screens. Laurence Boyce is a film journalist who likes Bond, Batman and Doctor Who (just to prove the things he enjoys things that don't just start with a 'B'). He is also a film programmer for various film festivals in the UK and abroad. « Alter Ego #153 July 2018 (magazine review).